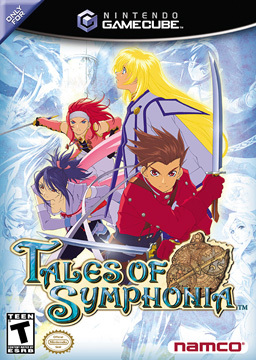 Tales of Symphonia, a Japanese role-playing game published by Namco, follows our hero Lloyd Irving and his childhood friend, Colette Brunel, on their quest to save the fictional world of Sylvarant. During their journey it is learned that saving their homeland puts a world parallel to their own, Tethe’alla, in jeopardy. Gameplay takes place in three major areas – overworld and field maps, town and dungeon maps, and a battle screen. In the overworld and field maps, assorted character driven skits can be viewed. Since its release, Tales has spawned a large media franchise in Japan – seven Manga collections, two series of novels, seven drama CDs, an OVA anime series, and sequels to the game itself.